I recently acquired an IBM 5154 EGA monitor that works pretty well. The only minor problem is that the screen is slightly off-center. 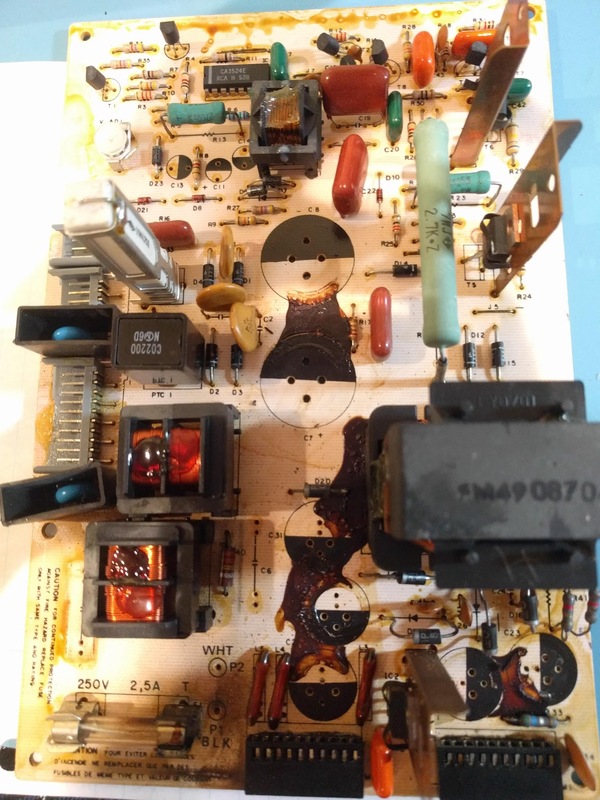 I decided to take it apart to adjust it, but discovered that many of the capacitors look as though they are leaking, including on the main board. Is this a leak or is it glue? I know it wasn't uncommon to glue capacitors like these down back then, but I have very little experience with electronics of this vintage. It's a little challenging to see in the picture, but whatever this is seems to be dribbling down the side from near the top. Most of the capacitors (at least the larger ones) look similar. The PSU definitely has a very busted tantalum capacitor, so I'll be recapping most of the PSU, but was hoping to not have to do the rest of the monitor as it's pretty difficult to take apart. Bulging pressure release plates at the top of the capacitor, with possible signs of leakage emanating from there. Absent both of those indicators, I'm inclined to think the staining of the PCB is from another source. 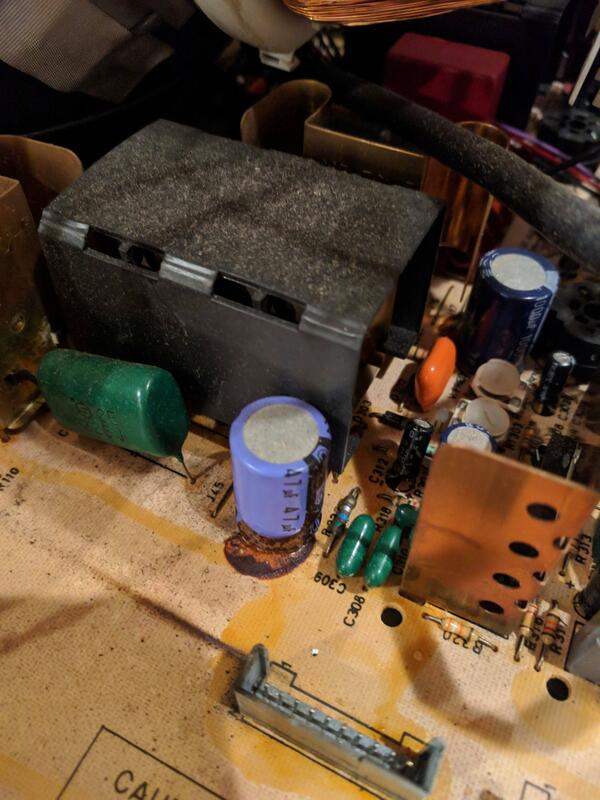 Also, the electrolyte from the caps is highly corrosive to the PCB. If you don't see anything that looks like corrosion, then you are lucky, and also should not blame the stain on electrolytic leakage. Another point worth noting is that caps that have leaked their electrolyte don't retain their rated capacitance. Naturally, that leads to symptoms of device failure. If you have a device that is working perfectly, and don't see any evidence of leaky caps, then removing and replacing caps is just a preventative measure - Many previously working retrocomputers have been rendered non-functional by preemptive re-capping using the wrong tools and technique. Not the answer you're looking for? Browse other questions tagged ibm crt-monitor maintenance or ask your own question. Found an IBM 5291. What is it, from when, and how much is it worth? When or should we expect our 8-bit motherboards to fail due to the capacitors? What, if any, routine maintenance does an old computer need? How to replace battery for old AT mainboard?